Microsoft Game Studios' boss thinks that Halo 3: ODST and Halo: Reach were missteps - because the player wasn't the Master Chief. Bungie may have departed its rich Halo fields for greener (?) pastures with Activision, but the franchise still continues under the watchful eye of 343 Industries and Microsoft Game Studios. Speaking with OXM UK at E3, MGS boss Phil Spencer made a frank admission: ODST and Reach weren't what gamers wanted. "The key question for me in managing the studio and the creatives is 'what is Halo? ', making sure Halo lives up to what I think gamers fell in love with [playing Combat Evolved]," he said. To him, that's putting the player in the role of SPARTAN-II John-117 - better known as Master Chief. 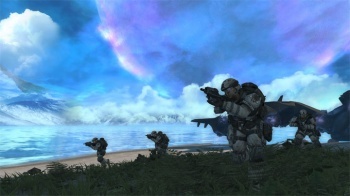 "We kind of lost our way [with ODST and Reach] a little bit, I'll say," he admitted. "And that's why I wanted to make sure that at the unveiling of Halo 4, you knew you were playing Master Chief, that John was back. Because Master Chief is the John Wayne character of that universe, and that's who you want to play." For long-time Halo fans, he said, Reach made perfect sense since it dealt with the franchise's story and lore - but for someone coming into the series it wouldn't make as much sense. I do get the appeal Master Chief as a character has for some, but if Spencer is trying to say that Reach didn't have the series' best campaign since the original Combat Evolved, then I have a few words for him. Or a few hundred words, really.